You should get to see a few animals and bugs on your expeditions. 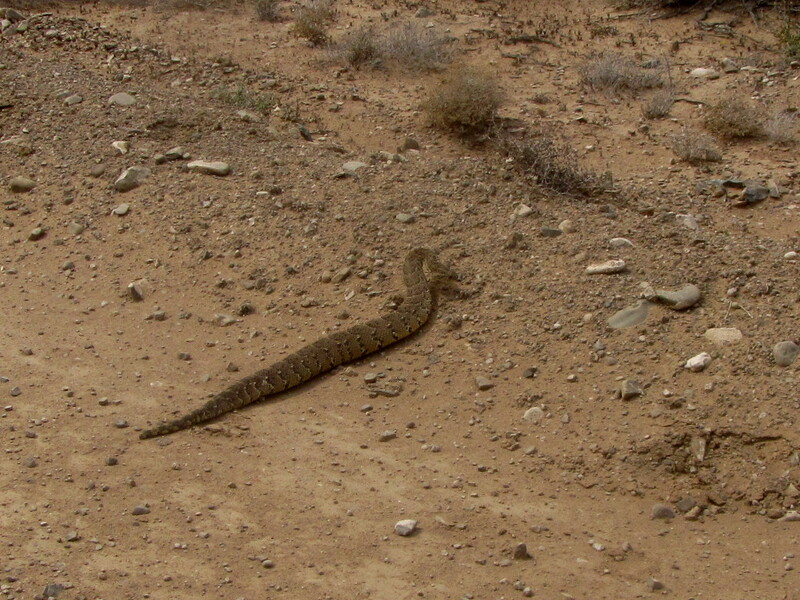 I have seen scorpions a few times, and snakes on only two occasions to-date. Caution should be taken with baboons, especially if you have dogs in your party. I saw a number of these little guys around the campsite at the Bontebok National Park, as well as one making a bee-line across the dirt road. 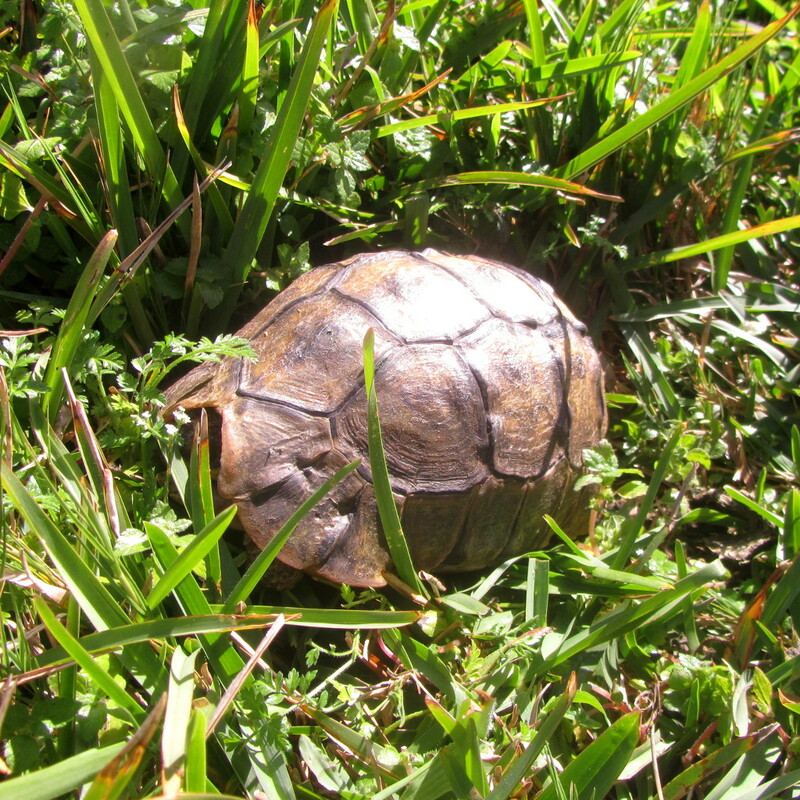 According to www.conservation.org: “The Cape boasts an impressive level of tortoise diversity. 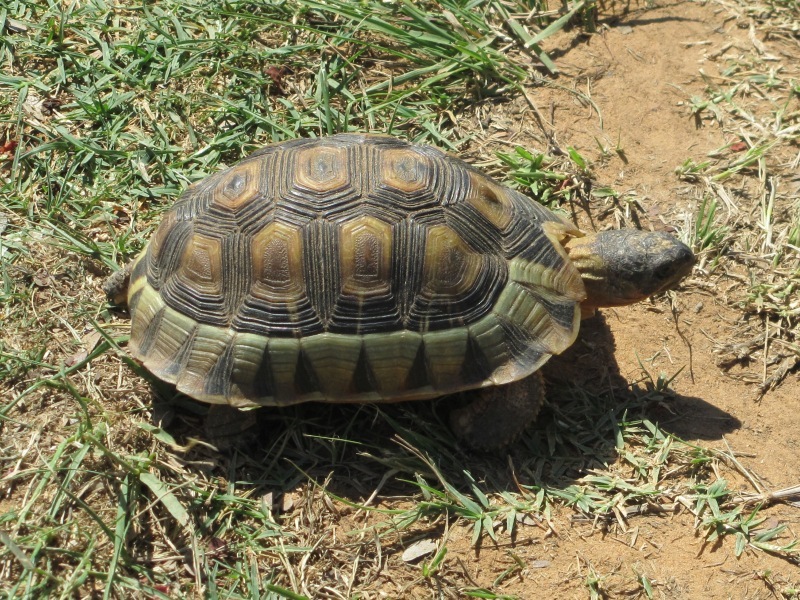 South Africa itself has the highest tortoise diversity on Earth, and five species are found almost exclusively within the Cape Floristic Region”. 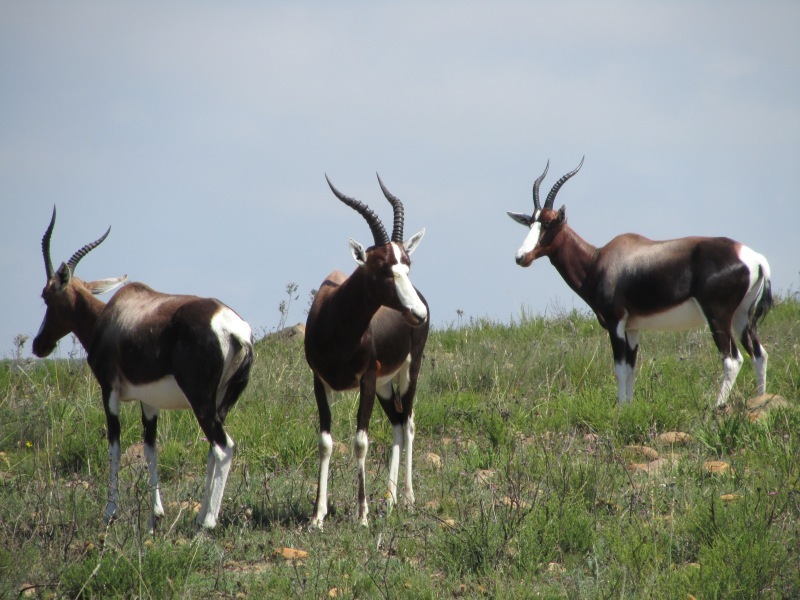 The Bontebok population was once reduced to 17 animals, but has since been increased to over 3000, a true conservation success story. The animal has a distinctive white blaze on its face, a round white patch on its backside, and recognizable, ringed, lyre-shaped horns. Spotted this lovely female Bushbuck along the side of the road in Nature’s Valley. 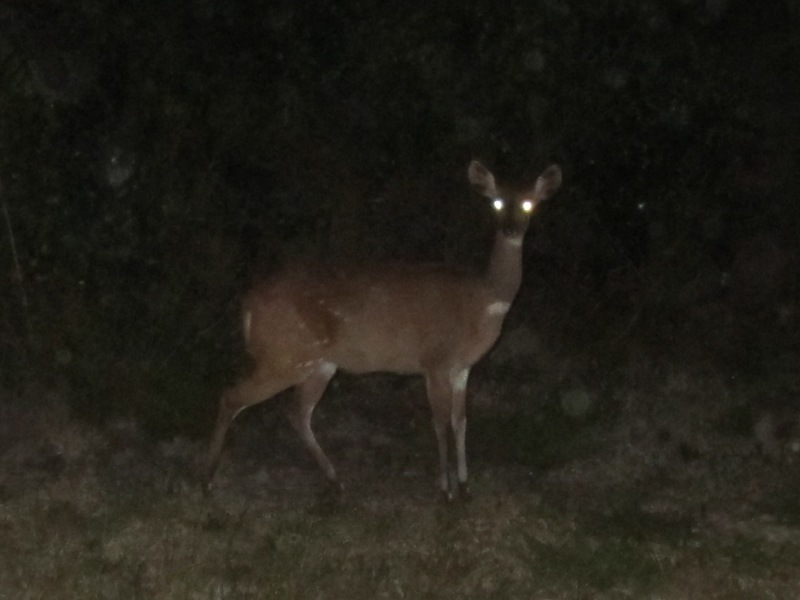 It seemed fairly unperturbed by the car and the camera flash. Snakes are a reality of the great outdoors, and you need to watch carefully where you put your feet! Another reason (besides safety and the prevention of erosion) to stay on the path! The Cape Cobra‘s powerful neurotoxin affects the respiratory system: 60% of victims die, usually of respiratory failure, which takes place within 2 – 5 hours. 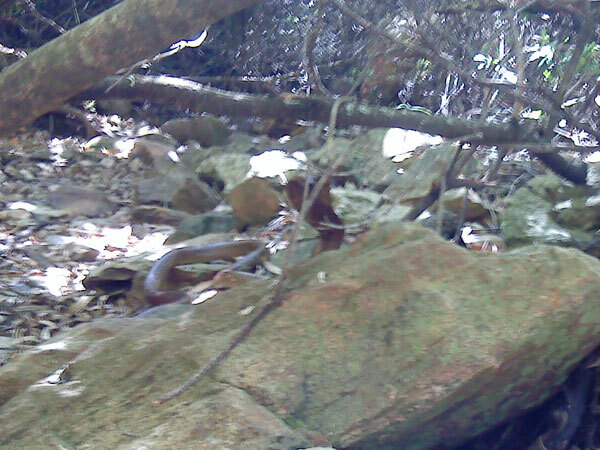 My first encounter with a snake was on the Bloupunt Trail in Montagu. From its appearance and behavior I am pretty sure it was a Cape Cobra. It had been on the trail in front of me, and as I was not being nearly vigilant enough, I had moved close enough to it that it had reared up with its hood extended, ready to strike. Considering I had broken another hiking rule, and was hiking alone, and was more than an hours walk from any help, I was extremely lucky to have looked up in time. A sobering thought. We generally only get to see these mammals when they are presented as gifts by the cats on the smallholding. The mole-hills they push up are a different story: they are evident everywhere on the property! 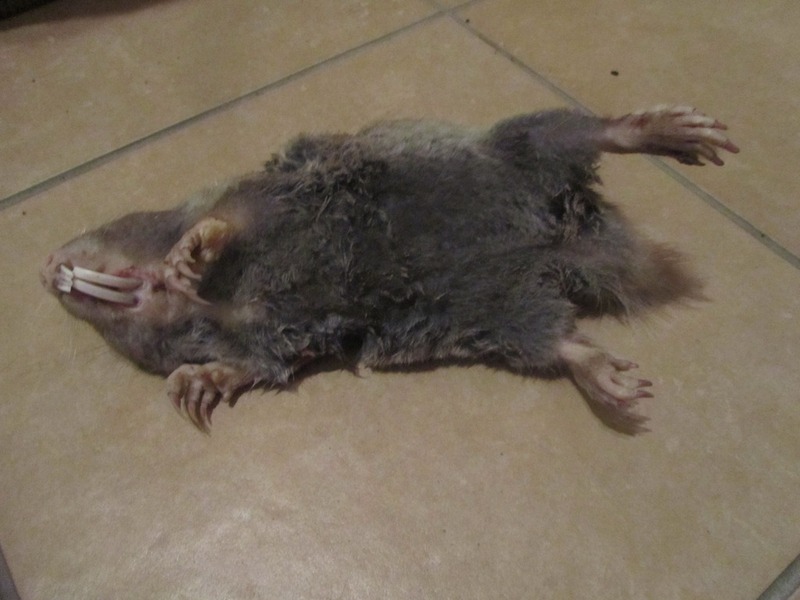 This large burrowing rodent is commonly found in the soft coastal sands of the Western Cape, especially coastal strandveld. 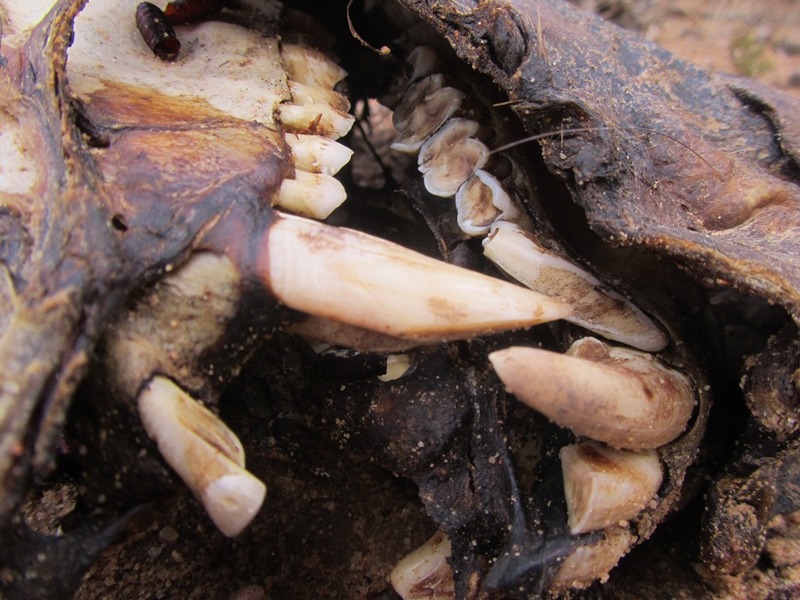 Have a look at those teeth! This quite skittish, but remarkably bold little visitor paid us a visit as we sat at night around the fire outside our chalet at Sanddrif in the Central Cederberg. It was active quite late at night, and in winter temperatures hovering around zero degrees. It had a very sleek body, a beautiful, long, striped bushy tail, and a cat-like face. 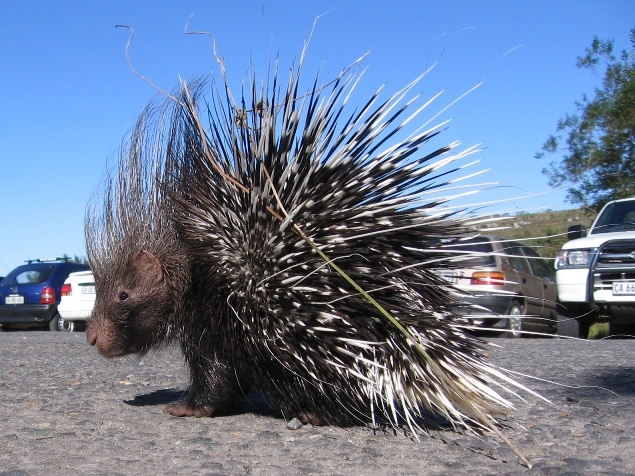 Porcupines are large, herbivorous rodents. The Cape Porcupine is nocturnal — the most you can normally hope to see is the odd quill lying around in the bush. I was lucky enough to see this little guy in the parking lot at Silvermine. He had obviously been disturbed from his sleep, and was a little disoriented and agitated. The Park Warden watching over him was waiting for a cage so that he could be taken back into the bush out of harm’s way. As you can see from the photo he is a healthy looking little guy, and quite curious. He rattled his quills in warning whenever I made a movement close to him. 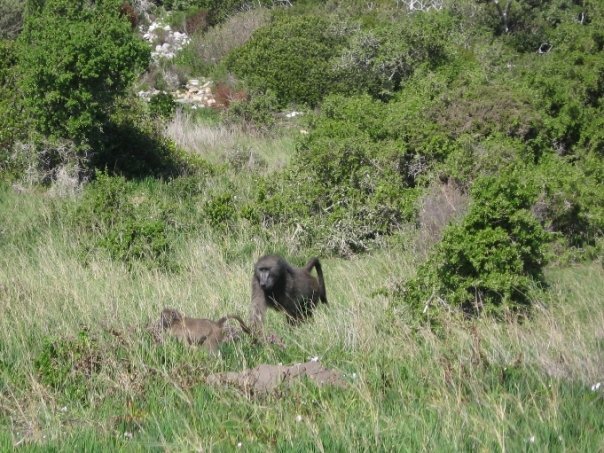 Chacma Baboons are fairly common on the Cape Peninsula (though there are none on Table Mountain itself) — you are hardly likely to spend a day at Cape Point Nature Reserve without coming into close contact with one of the four troupes in the area. Unfortunately, they are cheeky opportunists, and have learned that humans are an easy supply of food — mostly as a result of the stupider of the two (that would be the humans!) feeding them and leaving food around their habitat. Please be aware that they will approach you aggressively for food, and will grab anything they can — including your bags and cameras. Especially take care if you have dogs — the chances are your pet will come off very badly (most likely dead) from a fight with a baboon. As suburbia encroaches on their natural habitat, baboons are now frequently coming into built-up areas with disastrous results. 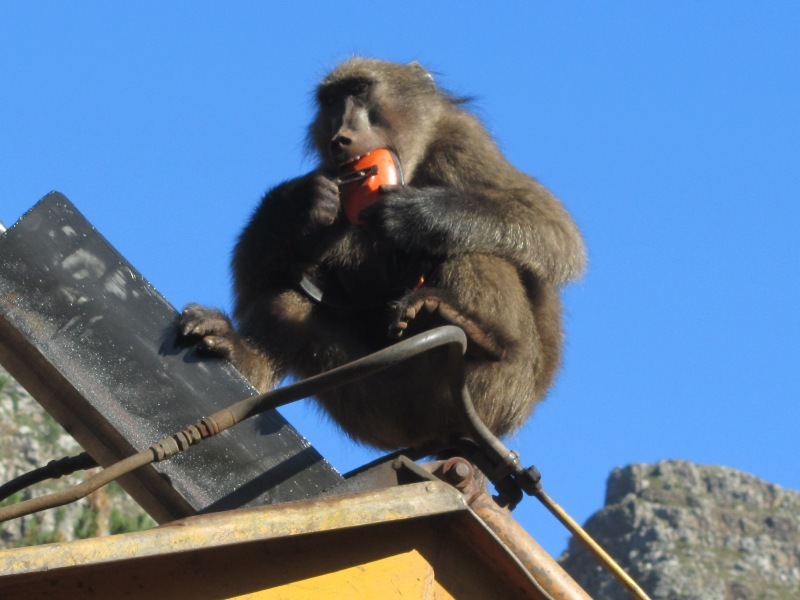 There are various initiatives in place to deal with this problem, for instance in the Cape Point Nature Reserve you will quite likely bump into one of the “baboon chasers”! 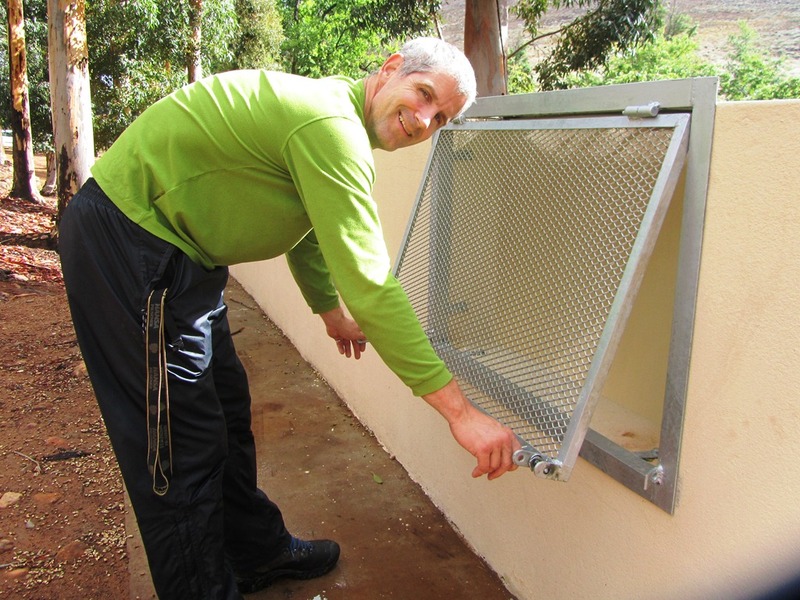 The baboon monitoring programme is being managed by Nature Conservation Corporation (NatConCorp), who have a 24/7 Baboon Help Line for all problems related to baboons. Do not hesitate to call them on 071 588 6540. I came across these young baboons playing next to the road on Mitchell’s Pass near Ceres. As cute as they were to watch, the heartbreaking truth is that they were way too comfortable in my presence, and were raiding the bins in the roadside culvert. I dare say their playful little show is something that is all too often rewarded with titbits from their human audience. 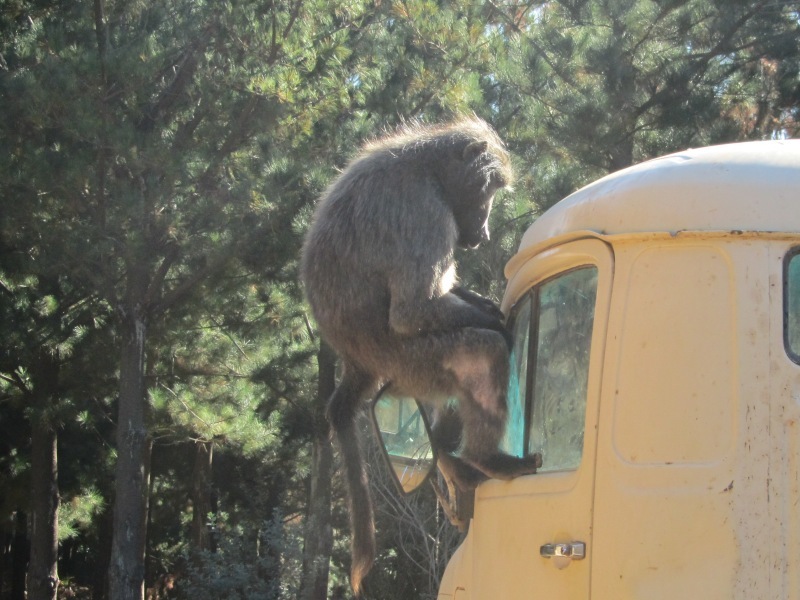 The behaviour of baboons in their natural habitat where their exposure to humans is minimal is in stark contrast to what you may observe in the areas mentioned. On a recent winter trip to the Central Cederberg, I witnessed a small troupe moving through the cottages at Sanddrif. They scattered into the veld immediately I moved toward them. As I drove back to Cape Town via Ceres, I passed 4 troupes along the dirt road which was encouraging. What was more heart-warming was that they were extremely shy and moved quickly off into the fynbos as I approached on the road. Please do all you can to help in this matter. Never feed or leave food around where baboons are found, never interfere with baboons in any way, and attempt to educate people to do the same. Sightings: Tokai Arboretum; Cape Point Nature Reserve; Beaverlac; Algeria, Sanddrif, Cederberg. 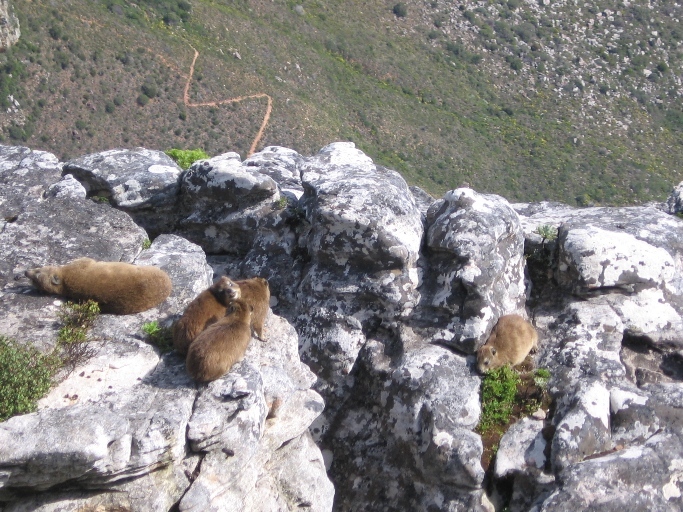 Dassies (Cape or Rock Hyrax) are commonly found in rocky outcrops. They are believed to be the closely related to — of all animals — the elephant. I cannot remember ever having been in the vicinity of the restaurant on Table Mountain without seeing a couple of them. Please do not feed them: the population on Table Mountain has suffered considerably from a junk food diet courtesy of idiot tourists who do not heed the signs pleading with you not to do so. They are docile little critters more cared with sunning themselves than paying any attention to you, and will scatter if approached. It is not unusual to see them along the coastline. On a trip to Jongensfontein we saw plenty of dassies amongst the rocks. Their boldness in not scattering until we were within metres suggests that they are fed here also. I would be interested to know if and how their diets differ from dassies living in the mountains. 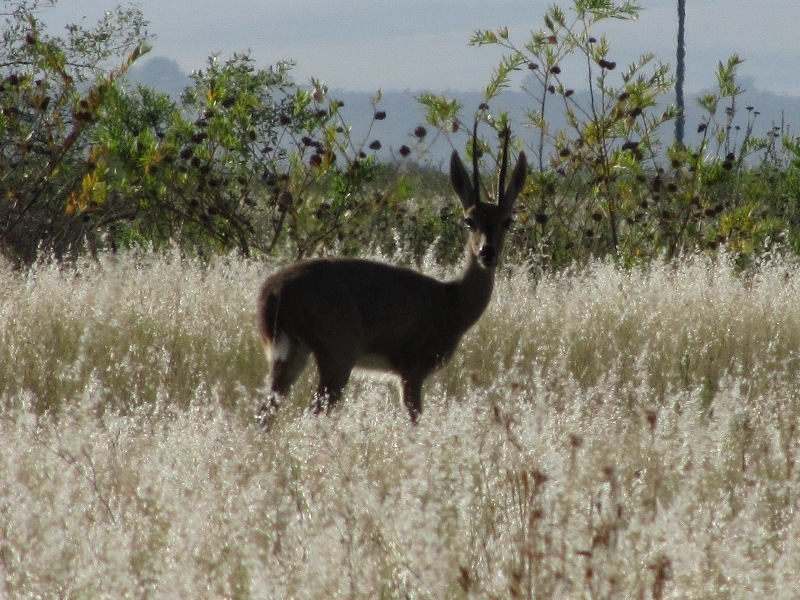 There are a number of Grey Rhebok in the Cederberg: I have seen them close to the road near the Driehoek turn-off, as well as in the vicinity of the Wolfberg Arch. 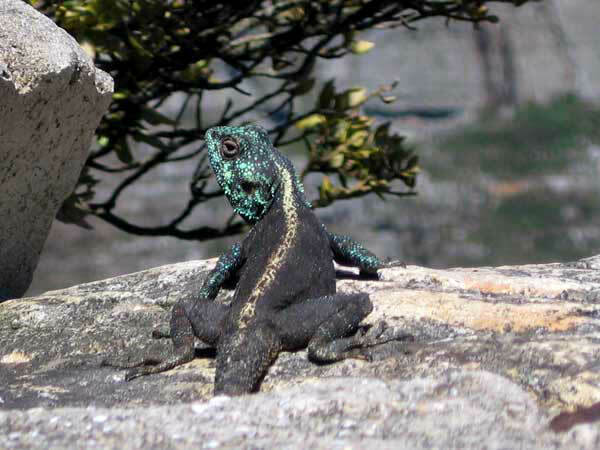 A program to eradicate these little guys from the mountain was started a while back (and then stopped as a result of the outcry) as they are not indigenous to South Africa. 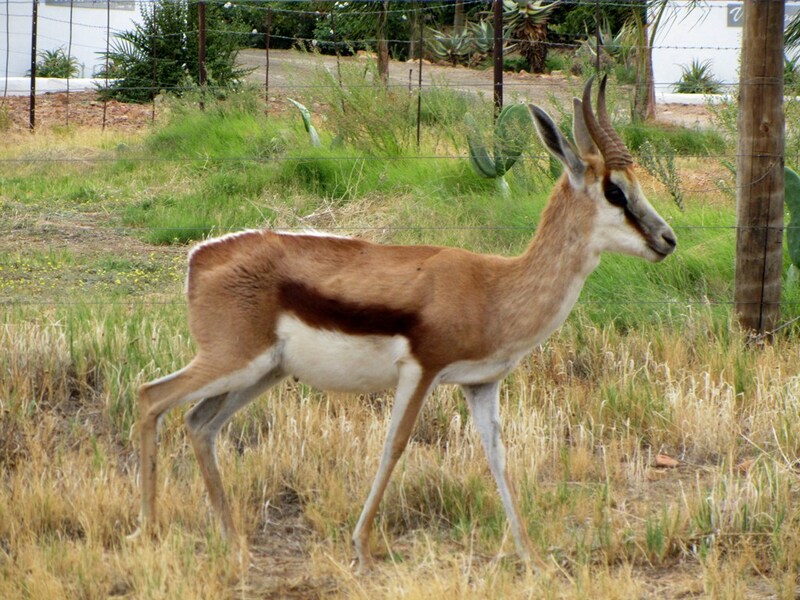 They cause erosion, as well as compete for territory with indigenous fauna, like the Klipspringer. There are supposedly only about 50 left. I have seen them on a number of occasions — each time there were three of them. Is it possible that these are the last three? Whilst I understand the need for exotic flora and fauna to be removed from Table Mountain, I can’t help but find it thrilling to come in close contact with animals like this whilst in the outdoors — it must tap into some deep natural instinct! 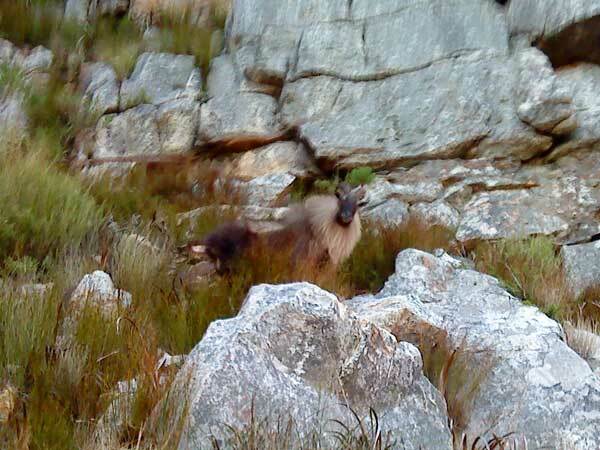 We saw a pair of beautiful klipspringers alongside the N1 in Du Toit’s Kloof on our way to Montagu. They bounded away from us as we approached, and then turned to pose for perfectly for the camera! We seem also to always be greeted by a few when we arrive in the Cederberg in the early morning. 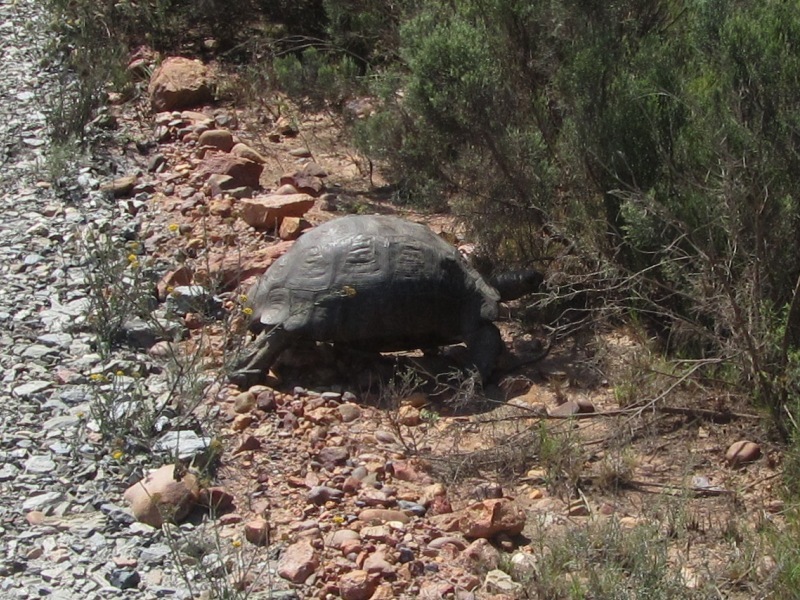 Apart from spotting quite a number of Angulate Tortoises in the Bontebok National Park, I spotted this much larger Leopard Tortoise just as he was heading off into the fynbos after crossing the road. 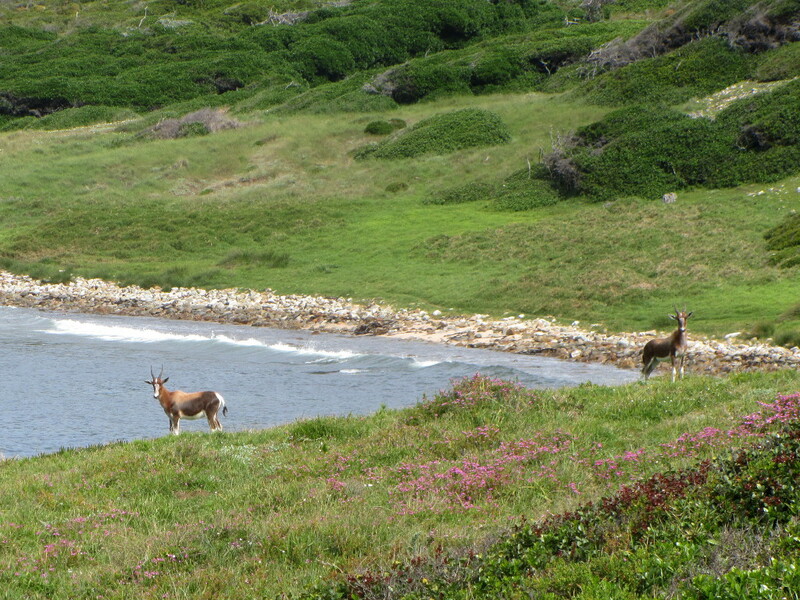 We also saw a number of them in Cape Point Nature Reserve, some surprisingly close to the shoreline. I have seen a puffadder on a number of occasions: on three occasions the snake was crossing a dirt road (once on the West Coast, once near Citrusdal, and another in the Tankwa Karoo National Park), and the the other it was lying hidden amongst some fynbos (on Little Lion’s Head). It is possibly the most common and widely occurring snake in Sub-Saharan Africa, and is responsible for more fatalities than any other African snake. The snake is fairly easily recognisable: it is fat, has a distinctive brown patterned skin, and a blunt head which is less triangular than that of most other snakes. The puffadder has a reputation for being lazy, preferring to lie in wait to ambush for passing prey — it is well camouflaged for this end. This, the fact that it does not readily flee when approached, and the extreme toxicity of its venom which is delivered by a powerful strike, combine to make it such a nasty character. The venom has cytotoxic effects, meaning damage, and possible death, are caused by massive tissue damage. This guy was made famous by this incredible GoPro footage of a collision with a cyclist! This little guy found his way into the bathroom of a holiday house we were staying in Plettenberg Bay. 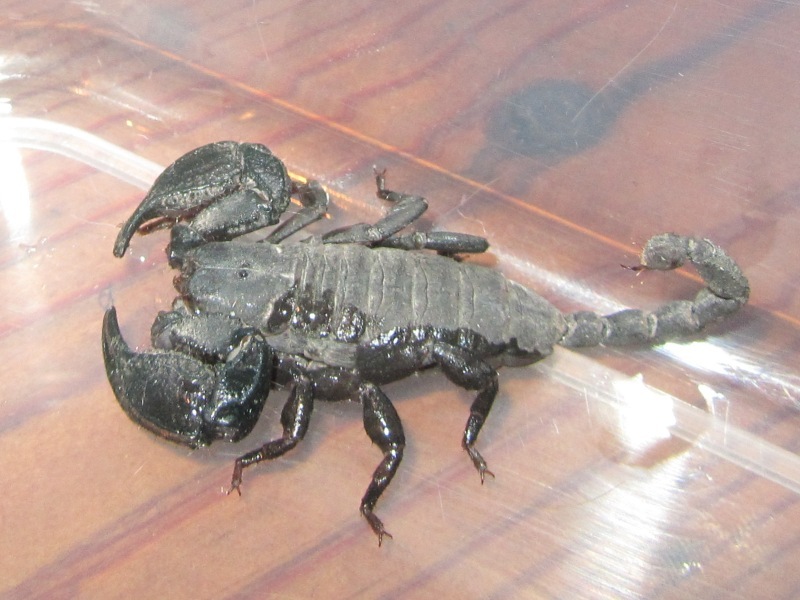 I think the general rule is that if the pincers are large and the tail small that it is less toxic than vice versa. But just as I don’t stick around to make positive IDs of snakes to know if they are venomous or not, I don’t take any chances! 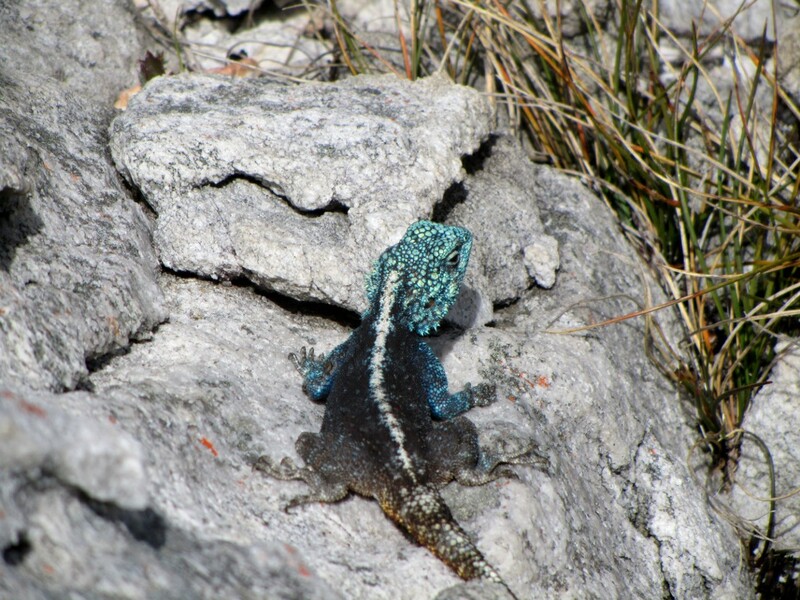 The Southern Rock Agama is a commonly occurring lizard — you will see these guys sunning themselves on rocks everywhere. Whilst not poisonous, they can apparently inflict a painful bite. As they are fairly timid, and will scuttle away if you approach, I think the likelihood of this happening improbable! 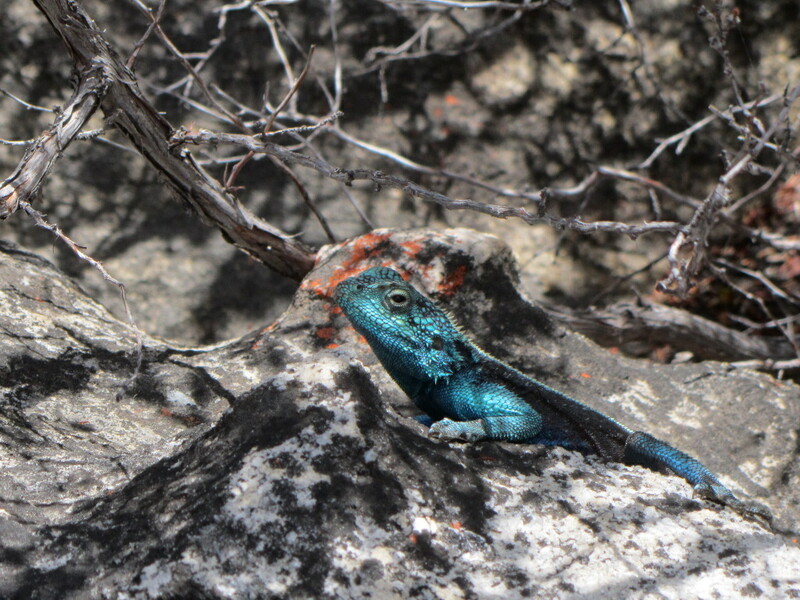 The blue colour of the males head and legs intensifies during the mating season. He really isn’t doing himself any favours in terms of camouflage and I guess it seems a bit odd that an adaptation that serves reproduction should at the same time in all likelihood also result in increased mortality due to predation! 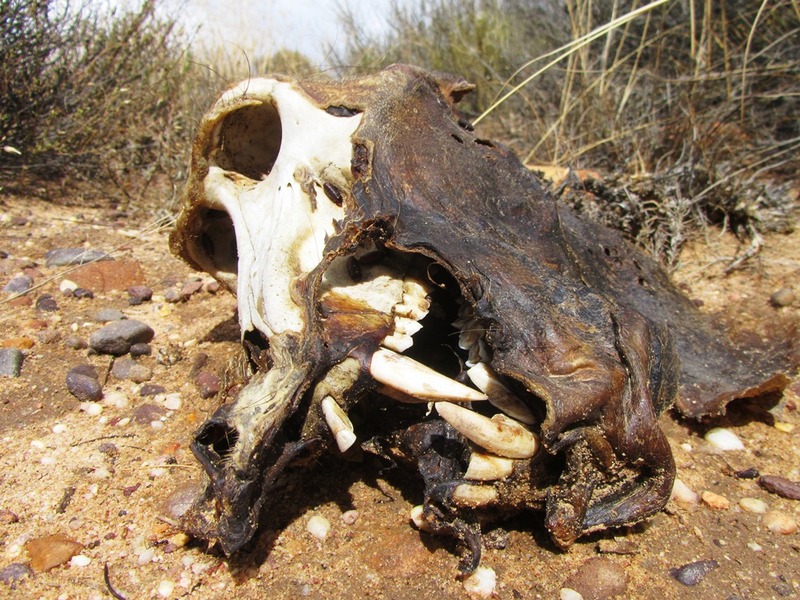 We saw a Fiscal shrike with a dead Striped Mouse near Matjiesrivier in the Cederberg. The mouse is pretty much the same size as the bird, and potentially quite a bit heavier. The bird seemed to be trying to carry the mouse off the road into the bush. When we approached in the car it flitted off to the side of the road and perched in the fynbos until we left. The Striped Mouse has distinctive stripes down its back. 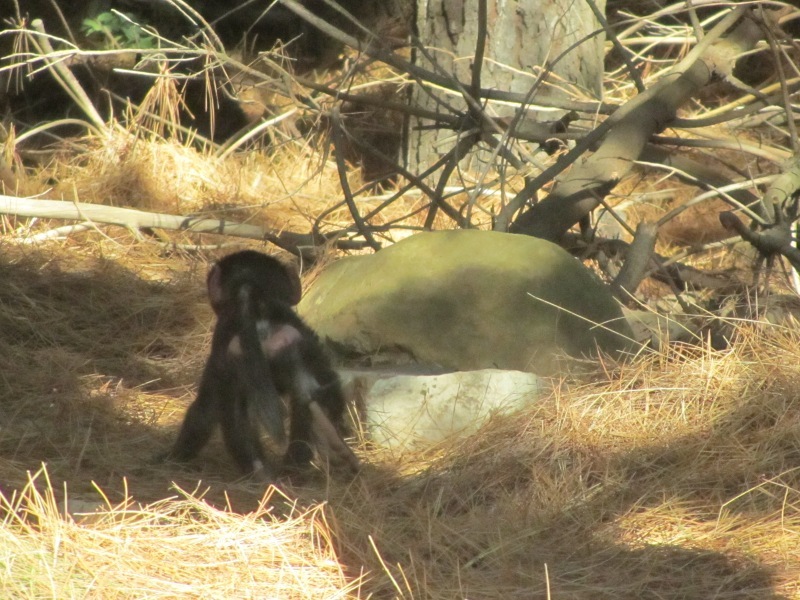 We saw this little guy whilst hiking up Constantia Corner. I am not a big fan of creepy-crawlies, but even though we suspected him of being a cockroach, he was so much cuter in nature than he would seemed in my kitchen! 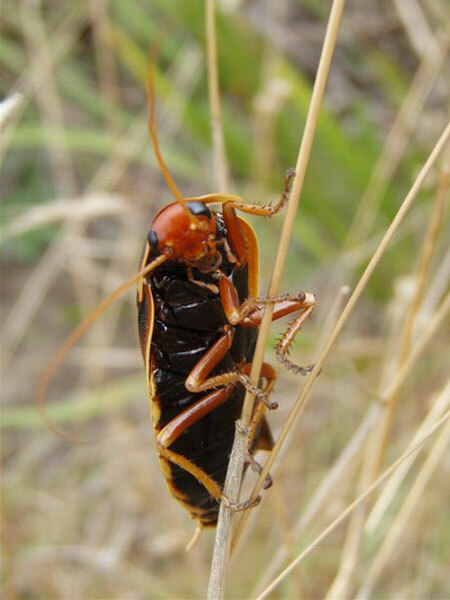 Says Michelle: “turns out he was a Table Mountain Cockroach (surprise! 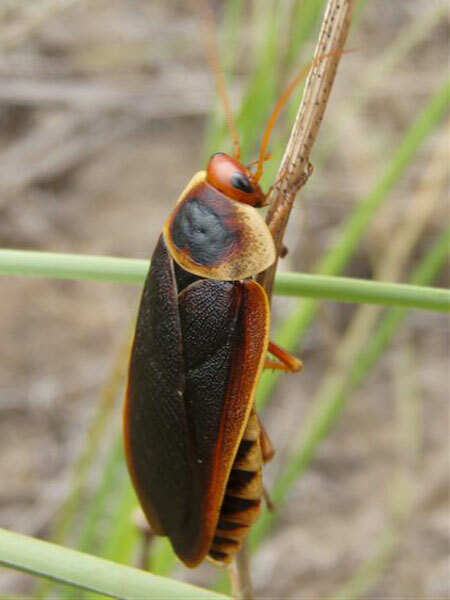 ), or Giant Cockroach — and a HE as the females don’t have wings (they resemble giant, striped woodlouses)”. They can grow to a size of 3 to 4cm in length. 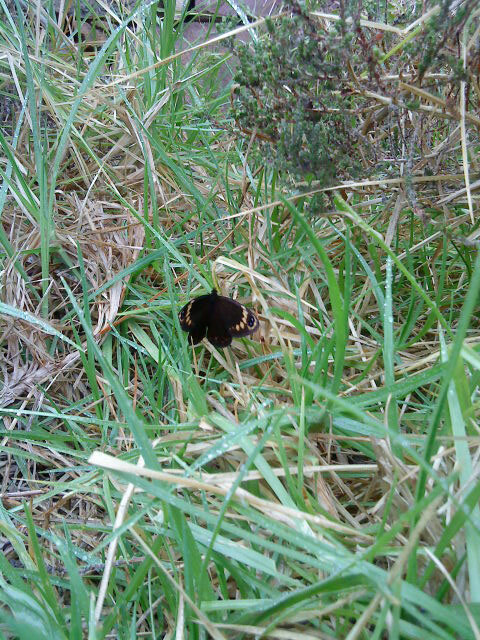 This butterfly seems fairly plain and common first sight, but has fairly pretty marking when viewed close-up. 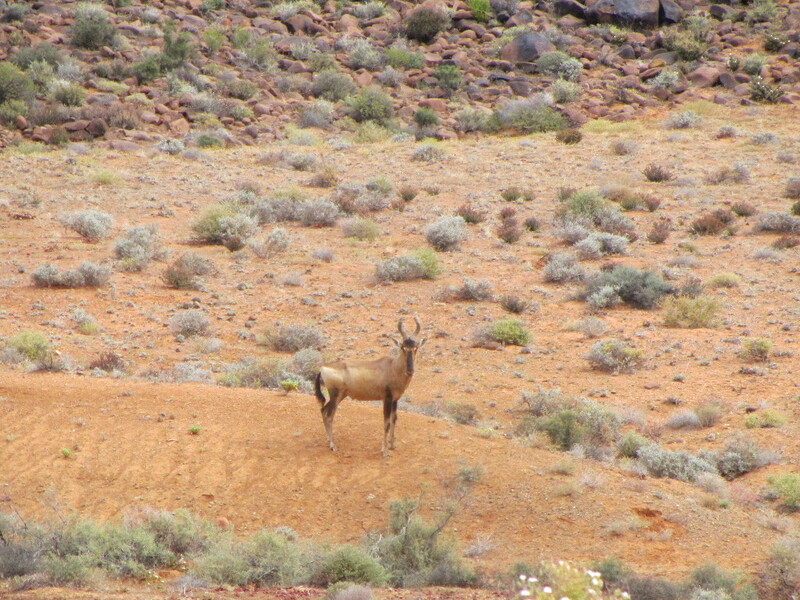 I was quite startled to see this Springbok strolling casually along the road in the Cederberg, but am assured by Leanne that it is quite common for farmers to keep them as tame farm animals. 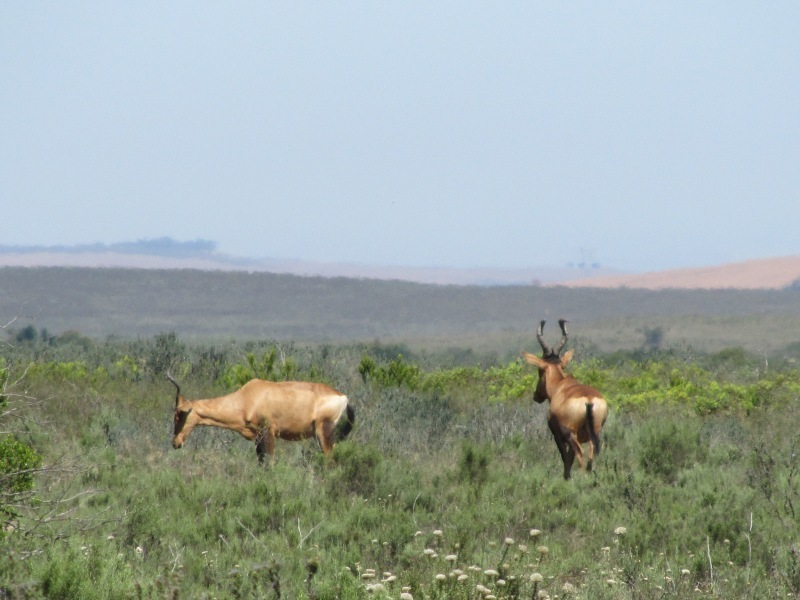 We saw a few in the distance on our trip through the Tankwa Karoo National Park, and were surprised to see that rather than being together in a herd, they were grazing great distances apart. We were delighted to see a baby springbok on the same trip! 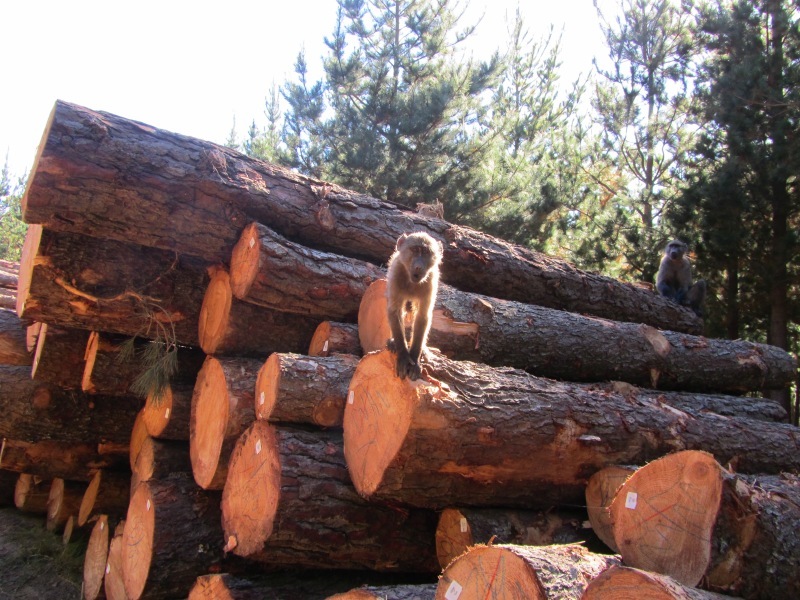 We met the cheeky guy in the video below at De Vasselot Rest Camp in Nature’s Valley. 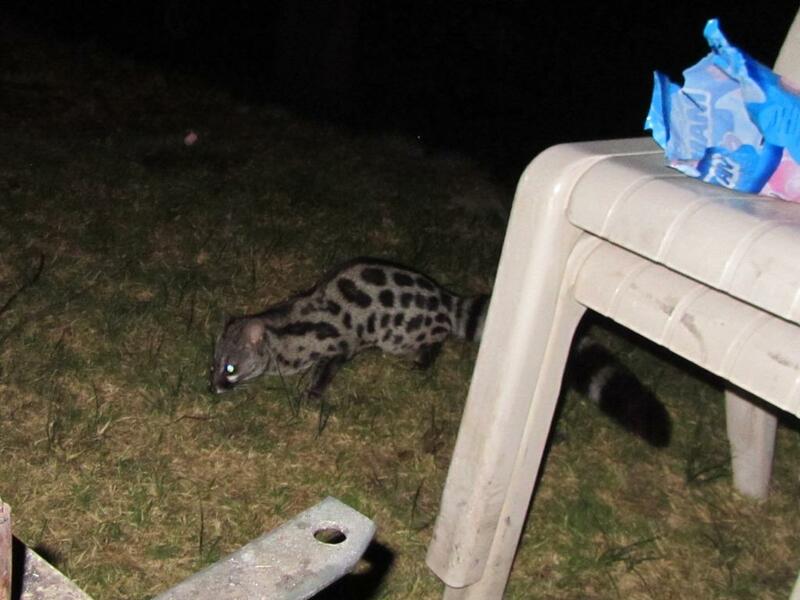 He spent some time scoping out the lay of the land before shooting down to steal some food off our camp table!